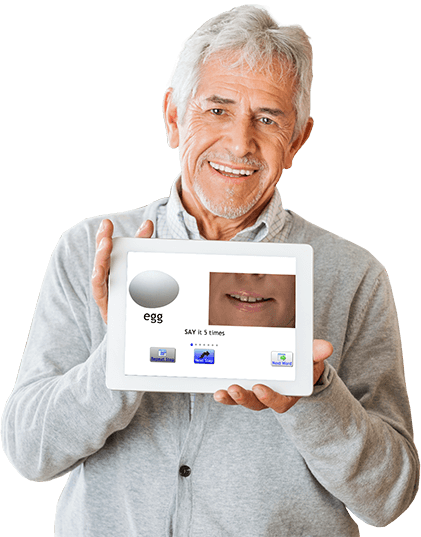 MoreSpeech.com - Interactive Speech & Language Practice on your iPad, PC, Mac or Tablet. “A great product! I'm a caregiver - the husband of a wife recovering from a stroke. But your app is [letting] me serve as a therapist. “I am using your MoreSpeech web app daily and have enjoyed it beyond belief. The new material is very challenging to me. “I am the mom of an apraxic son. He liked the idea of practicing at home [on his own]. This could be a gold mine for teens and adults with apraxia! I like how the instructor makes the sound, then has the student repeat while watching her lips. I am encouraged that morespeech.com is out there for us to try. Thank you so much!!! “I think MoreSpeech is great. I have been trying it with my husband. My husband has not been able to speak now for almost 4 years. This is so good and helpful. “I did the Speaking [Skill]… Great for using with a hearing impaired child who just had surgery on her ears and is hearing for the first time. Just what I was looking for. Can’t wait to use it next week with her. “He thinks it is the best. Your new program was the main reason for the iPad. A Fun, Effective Web-App to help stroke and brain-injury survivors. Try it free, as in : No Credit card. No Strings attached. Our team includes a speech therapist with over 20 years of clinical experience. A PhD with over 45 years of Clinical and peer-reviewed published Research, and a Software Engineer with over 30 years of experience.